New Delhi: The Congress-led United Progressive Alliance (UPA) government finds itself between a rock and a hard place, with a key ally threatening to withdraw support over the petrol price hike and activist Anna Hazare sticking to his demand for the passage of a “strong" Lokpal Bill in the coming winter session of Parliament. The government’s mounting troubles may jeopardize key policy reforms and also stall legislative business in Parliament, analysts said. Prime Minister Manmohan Singh’s 30-month-old government has been battered by a series of corruption scandals and controversies recently. Oil companies increased petrol prices on Thursday night, calling it “unavoidable", as the rupee’s depreciation had made crude oil imports costlier. The UPA government had granted autonomy to state-run firms last year to fix retail prices of petrol and has said it is considering giving up control of other fuel prices, given the mounting subsidy burden. Sensing the popular anger against the price rise, West Bengal chief minister Mamata Banerjee, leader of key alliance partner Trinamool Congress, demanded a rollback after a brief meeting with her top party leaders in Kolkata on Friday. “Trinamool Congress threatens to pull out of UPA, but final call after Prime Minister’s return (from the G-20 meet in Cannes)," Banerjee said in Kolkata. This followed a meeting by 23 of the party’s 25 members of Parliament at which they expressed themselves in favour of pulling out of the government. When Mukherjee eventually spoke to Mukul Roy, Banerjee’s close confidante and the Union minister of state for shipping, on the latest price hike, he said nothing could be done, according to Banerjee. “Enough is enough," she said. “Such decisions were taken unilaterally and without any discussion with anyone," the Trinamool chief said, referring to previous price increases. “We have protested several times, but never got justice. This is no way of running a coalition government." She said she would convey to the Prime Minister that “if this goes on, we don’t want to stay in the government. We have tolerated enough, but we are not willing to accept this burden on the poor any more". Two other allies, the Nationalist Congress Party and the National Conference also expressed their unhappiness with the increase in petrol prices, but did not issue any threats of withdrawal of support. However, Singh’s government will be reduced to a minority in the 545-member Lok Sabha if Banerjee’s 18 members pull out. Although finance minister Mukherjee said the government had no role to play in the price rise, a senior leader in the Congress party indicated that there could be a rollback after Singh returns on Saturday morning. “Whatever views they (allies) have, the government will look into it seriously," said Abhishek Manu Singhvi, Congress spokesperson. The main opposition Bharatiya Janata Party (BJP) has already stepped up the offensive against the government. “This government has become totally insensitive to the suffering of the people of this country... This could not have happened without the knowledge and consent of Congress president Sonia Gandhi and the Prime Minister," said senior BJP leader and former Union finance minister Yashwant Sinha. Meanwhile, Hazare, who is in the national capital to attend a meeting with a parliamentary committee to discuss the anti-graft Bill Lokpal, has threatened another fast to escalate the pressure on the government for the speedy passage of a strong Lokpal Bill in Parliament. 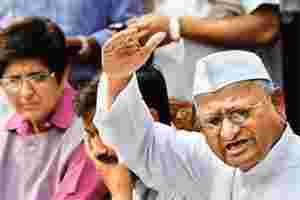 Hazare also said he will campaign against Congress in the five poll-bound states next year if the UPA fails to get the Lokpal Bill passed in the winter session of Parliament, which begins on 22 November. “When the winter session of the Parliament ends and if a strong Lokpal Bill is not passed, then we will tour the five states and tell the people... not to choose them (UPA) again," Hazare told reporters in the capital. Kumar Ketkar, political analyst and chief editor of the Marathi daily Dainik Divya Marathi, said that Singh should call mid-term polls. “The internal integration of the UPA has collapsed and it’s more a virtual reality than an actual reality. Now that the crises have deepened, the Prime Minister should go to seek people’s verdict," Ketkar said. Subrata Mukherjee, former professor at the department of politics in Delhi University, is of the view that the allies’ public posturing against the ruling party and the price rise was quite “natural". However, Mukherjee pointed out that the government’s conflict with key allies would impact governance. “This kind of unease among the coalition partners will definitely lead to a decline in the legislative business and is bad news for the government in its efforts for new policy initiatives," he said. Arnab Dutta in Kolkata and Reuters contributed to this story.